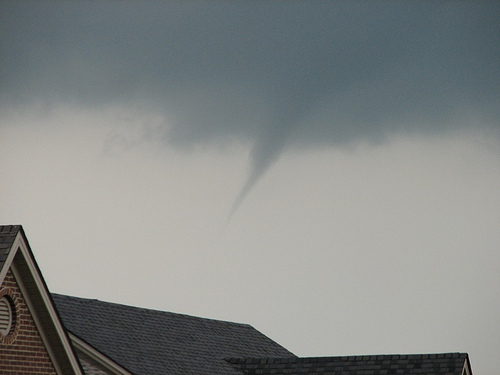 What Causes Cold Air Funnels? 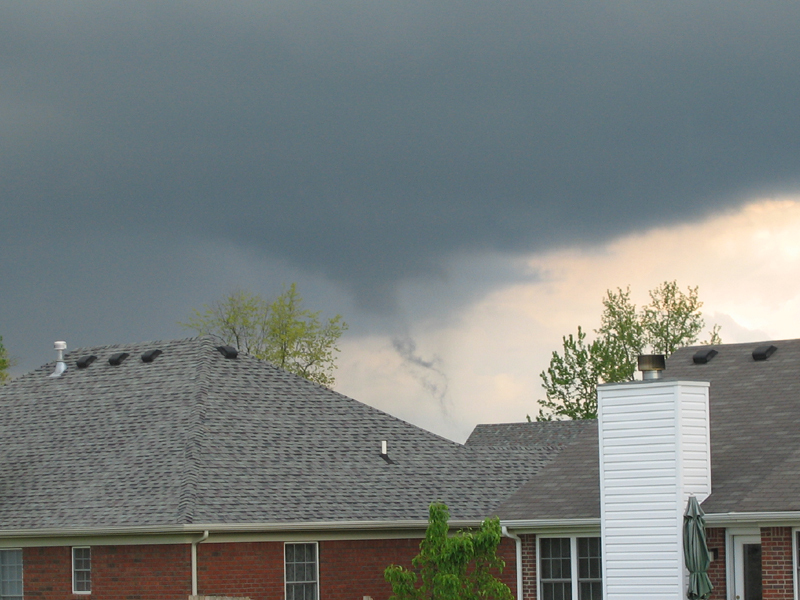 Weather.gov > Louisville, KY > What Causes Cold Air Funnels? Cold air funnels form beneath showers or weak thunderstorms when the air aloft is especially cold. The funnels are most common in the fall and spring when the sun is able to heat up the lower levels of the atmosphere, causing convection to bubble up and form showers, but temperatures around 15,000 to 20,000 feet above the ground are quite cold. Cold air funnels are usually harmless, but on rare occasions they can touch down and cause EF-0 level (winds up to 85 mph) tornado damage. The map below shows temperatures aloft during a cold air funnel event that took place in Missouri on September 25, 1994. Colder temperatures are shown in the purple and blue colors. Note the pool of very cold air aloft over eastern Missouri and western Illinois. Below is a surface map from the same event shown above. Low pressure is centered near Chicago and moving into the Great Lakes, placing Missouri "behind" the low, which is not where one would normally expect tornadoes to form. In fact, on this day, tornadoes did occur along the cold front that stretched from the Great Lakes into the Ohio Valley, as one would expect. However, a weak trough of low pressure, indicated by the dark dashed line from Missouri to Oklahoma, was enough to help trigger some showers. That, combined with the chilly temperatures aloft, helped cold air funnels to form. 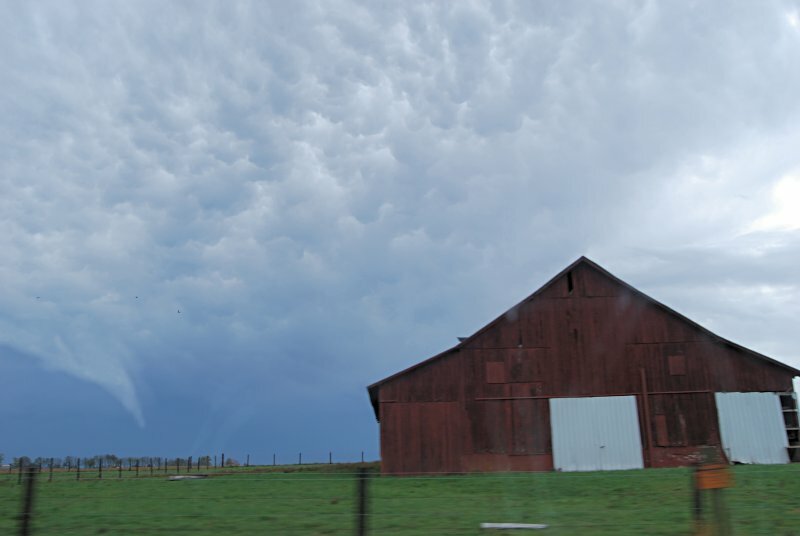 As a matter of fact, three of the funnels in Missouri did touch down and produced EF0 damage to barns, trees, and two houses. It is usually not necessary for the National Weather Service to issue Tornado Warnings for cold air funnels since it is so rare for them to make it all the way to the ground and become a tornado. They are also difficult to detect on radar since they are very weak. 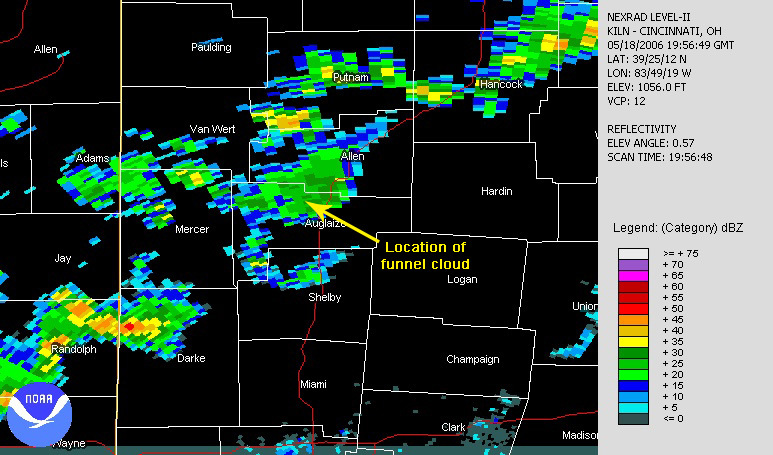 Spotter and public reports are essential when cold air funnels are in the area. The NWS will usually issue a Special Weather Statement when cold air funnels have been reported. Of course, a Tornado Warning will still be issued if it is felt that a funnel will touch down. 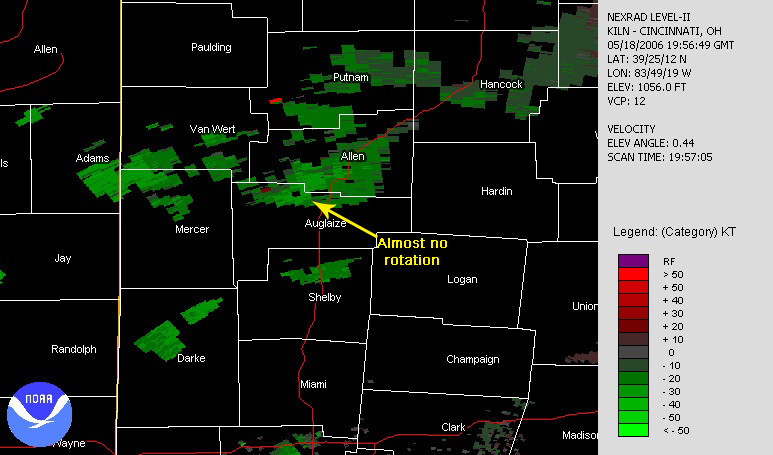 Below are Doppler radar pictures of a shower that produced a cold air tornado in Ohio on May 18, 2006. The first picture shows reflectivity, in which the green colors indicate that only light rain was falling. The second picture shows velocity. On velocity pictures we look for bright red colors to be located right next to bright green colors as a signal of strong rotation in a storm. Note that there is no rotational signature in this shower despite the EF0 cold air tornado. If you spot a cold air funnel cloud or tornado, please let us know!